In this May 12, 2017, file photo, former Los Angeles County Sheriff Lee Baca leaves federal court in Los Angeles after he was sentenced to three years in prison for obstructing an FBI investigation into abuses at the jails he ran. Baca faces time behind bars after a court Monday rejected the appeal of his conviction on corruption charges. LOS ANGELES (CNS) — A federal appeals court panel Monday rejected former Los Angeles County Sheriff Leroy Baca’s appeal of his conviction on charges of obstruction of justice and lying to the FBI. The 76-year-old for­mer sheriff, who has Alz­hei­mer’s disease, was sen­tenced in May 2017 to three years in federal pris­on, but has remained free pending his appeal. The appellate panel’s ru­ling does not auto­matically mean Baca will be going to pris­on. He could request a review by the full 9th Cir­cuit or appeal to the U.S. Supreme Court. 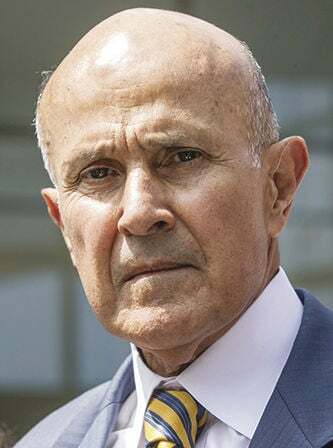 During arguments be­fore the U.S. 9th Circuit Court of Appeals panel in No­vem­ber, Baca attorney Ben­jamin Coleman con­tended that the trial judge in the case had abused his discretion by barring jurors from hearing evidence of the former sheriff’s Alz­heimer’s diagnosis. Coleman argued the ru­ling could have affected all of Baca’s criminal con­vic­tions and urged the ap­pel­late panel to overturn the guilty verdicts. But the appellate panel found that the trial court “did not abuse its dis­cre­tion” by rejecting as “un­reliable” testimony about the extent of the disease’s impact on Baca when he lied to investigators. Hochman said he would seek further review from the court’s full panel of 11 judges. Alden said the defense could not prove that Baca was actually suffering from Alzheimer’s disease at the time of the events for which he was convicted. All ev­id­ence supporting the Alz­hei­mer’s claim, Alden said, was “anecdotal,” in­clu­ding incidents where the ex-sheriff had forgotten the name of a medication he was taking, that he was de­scribed by a co-worker as being “confused,” and that he had forgotten the last name of a colleague.